LOS ANGELES (AP) Points came easily for Steph Curry on Saturday. Eleven in his first five minutes, 17 before the game was 8 1/2 minutes old. 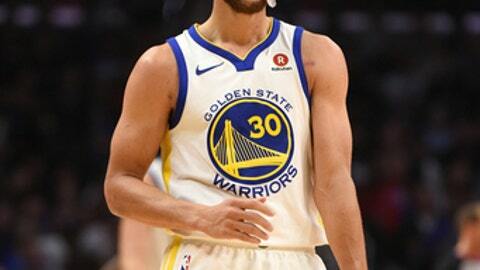 He finished with a season-high 45 points without playing the fourth quarter and the Golden State Warriors ran away from the Los Angeles Clippers 121-105 for their fourth straight victory. Curry took advantage of the guard-depleted Clippers, making 11 of 21 shots, including 8 of 16 3-pointers, going against rookie Juwan Evans and G-League call-up Tyrone Wallace. In the four games since missing 11 with an ankle injury, Curry has averaged 36 points on 58 percent shooting, 54 percent beyond the arc. The Clippers’ Blake Griffin suffered a concussion late in the first quarter when he stumbled driving into the lane from the right wing and hit his head on JaVale McGee’s right elbow. Griffin fell to the floor immediately, and remained down for several minutes as team physicians tended to him. He walked off under his own power and went to the locker room. Nick Young and JaVale McGee each scored 11 points, and Klay Thompson and David West added 10 apiece for Golden State, playing with Kevin Durant sidelined by a right calf strain. The Warriors improved to 17-2 since Nov. 27. Lou Williams scored 23 points, and Jordan added 15 points and 11 rebounds for the Clippers. They lost their 12th straight to the Warriors, dating to Dec. 25, 2014. Tyrone Wallace, signed Friday, added 13 points in his first game for Los Angeles. Tied at 50 with 3:30 left in the second quarter, the Warriors went on a 23-9 run, capping the stretch with Curry hitting a 3-pointer with 8:41 left in a third quarter. Golden State went up 103-73 on McGee’s dunk with 55 seconds in a quarter that would see the Warriors outscore on the Clippers 39-22 for a 103-76 lead with 12 minutes to play. Warriors: The Warriors won their 10th straight road game, improving their road record to 17-3. Thompson hit a 3-pointer with 1:06 left in the second quarter, extending his streak of games with a made 3-pointer to 94, the longest active run. F Andre Iguodala started for the third time this season. Clippers: F Sam Dekker made his first start of the season. In the first two starts, rookie Juwan Evans has drawn the assignment of guarding Russell Westbrook two nights ago and Steff Curry this afternoon. With guards Austin Rivers (right ankle) and MilosTeodosic (sore plantar fasciitis) out with injuries, the Clippers were forced to waive F Jamil Wilson, who had started 10 games and averaged 7.0 points on 46 percent shooting, on Friday. In Wilson’s place, G Tyrone Wallace was singed a two-way contract. After dramatic victories in back-to-back games over Dallas and Houston, Warriors coach Steve Kerr worried about how the Warriors would react to the game’s 12:30 p.m. starting time. Warriors: At Milwaukee on Monday night. Clippers: Host Atlanta on Monday night.